We are pleased to announce that Horde Groupware Webmail is now available on BitNami! 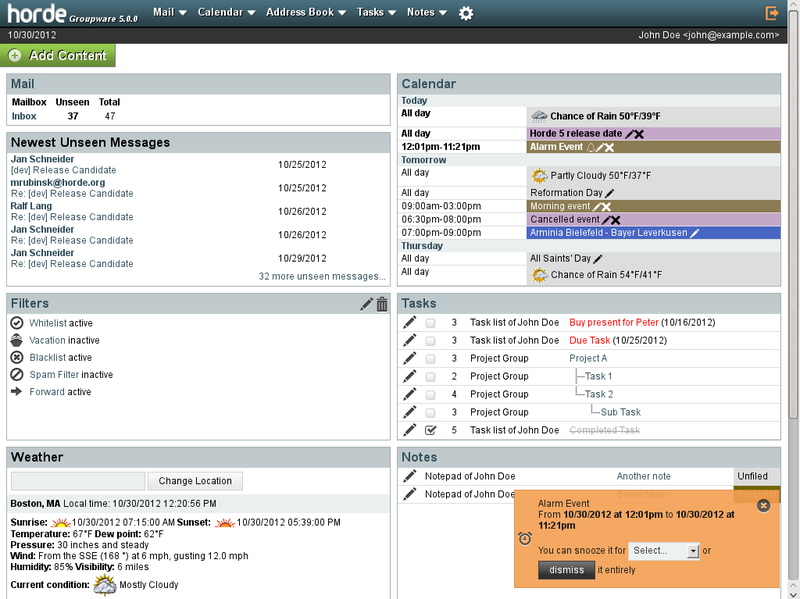 Horde is an open source, enterprise-ready, browser-based communication suite. Users can read, send and organize email messages and manage and share calendars, contacts, tasks and notes with the standards compliant components from the Horde Project. You can now download free, ready to run native installers for OS X and Linux, an Ubuntu-based virtual machine and Azure and Amazon EC2 cloud images. You can also now launch a free cloud demo server with the BitNami Cloud Launchpad by clicking the launch button below. Jan Scheneider, core developer and a founding member of Horde LLC was kind enough to answer some questions for those of you who may not be familiar with the project. 1. What is the goal of the Horde Groupware Webmail application? 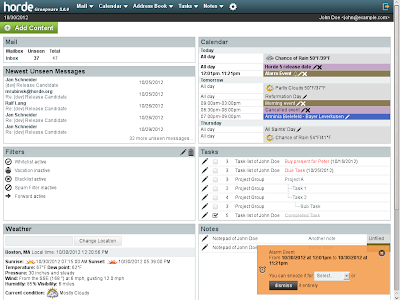 We aim to provide the most flexible web based Groupware available. The strong points and the focus of Horde Groupware are: flexible integration with existing infrastructure, extensive configuration and customization options, strong support for standards. 2.- What are the main features of Horde Groupware Webmail? Customizable portal screen including applets for weather, quotes, etc. 3. Which projects or organizations are using Horde Groupware Webmail currently? Horde is especially strong in academic and hoster environments. You can find important companies and organizations at the Horde's deployments page like SAPO Mail (Portuguese ISP), Versatel.nl, University of Michigan, Columbia University and more. 4. What are the benefits for Horde Groupware Webmail to be available as BitNami stack installers, virtual machine and Azure & Amazon cloud images? BitNami stacks make it easier for new users to get started with Horde Groupware Webmail. It also simplifies to test new versions or run the application in the cloud easily. We are glad Horde Groupware Webmail is now part of BitNami. Would you like your favorite app to be part of BitNami? Make sure to suggest and vote for it in our contest!